I have told you all before and I will say it again, I <3 Blazers! This one in particular I purchased at Macy's in New York and for some reason I could not put it back on the rack. It is one of those pieces that you know you will wear eventually but not at that particular moment. I had to purchase it! I chose this blazer in particular because of the fit. I like when blazers are loose but not over-sized. Tip: It is important to find a blazer that sits well at the hips. Anything far below the hips, or above the waistline may cause the body to look awkward. I was particularly drawn to the print. I felt like and still feel like I am looking at art. I have my typical black, gray, and white blazer but had never owned anything like this. It was a great investment! Tip: Should you decide to purchase a blazer in this color scheme, also try colors that mix red, black, white or even green. Wearing a blazer that had yellow or orange might be a little too loud depending on where you are going. This color scheme works for multiple occasions. I kept my accessories simple ! Usually when I want my focus to be on one particular thing, I will keep the rest of my accessories neutral. Tip:You don't always have to play it safe with accessories. I just chose for this look to keep it simple. 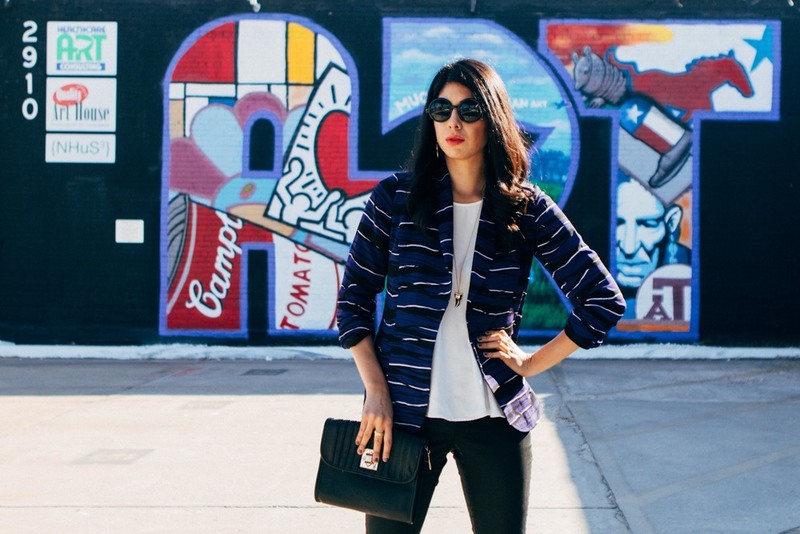 Check out some of my most recommended wearable art blazers below!